By 2025, it is predicted there will be 7.2 million international students studying globally. A recent British Council survey of 153,000 international students confirmed opportunities for migration exert an extraordinary impact on the choice of study destination. While students sought a high quality, internationally recognised education, the scope to remain and work was found to massively impact both decisions and expectations. In 1999, following the removal of a three-year eligibility bar , international students became immediately eligible to migrate to Australia. Within six years of the policy change, 52% of skilled migrants were selected onshore. International medical students have funded their own studies to meet Australian requirements. PhotoDu de CreativeDomainPhotography com By 2010, 630,000 international students were enrolled in Australian courses (all fields and sectors). Of these, 18,487 were undertaking health degrees, including over 3,000 medical and 10,000 nursing students. International medical student graduates grew 223% from 1999 to 2009, compared with 52% growth in Australian domestic graduates. 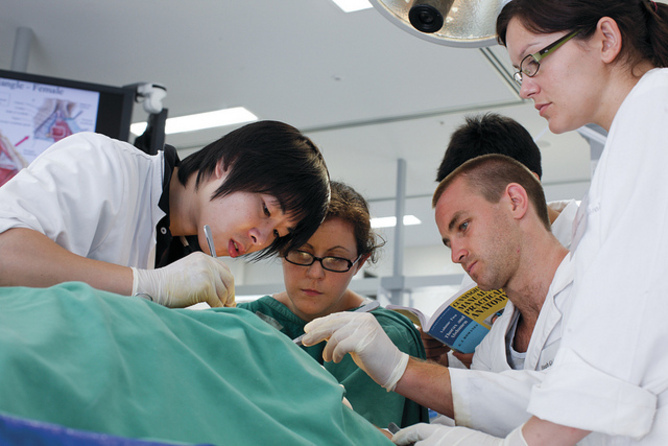 International medical students In 2009, the majority of international medical students were enrolled at Monash, Melbourne, Queensland, New South Wales and Sydney universities. Their source countries were highly diverse most notably Malaysia (1,134 students), Singapore (577), Canada (437), the United States (84) and Botswana (74), followed by South Korea, Brunei, Hong Kong, Indonesia and Sri Lanka. These international students achieve stellar rates of immediate employment and are highly attractive to local employers. As demonstrated by yet-to-be-published research conducted for the Medical Deans of Australia, 45% of international students plan to remain in Australia when they commence their studies. By their final year, 78% accept intern places (virtually all those who are not scholarship students sponsored by their home governments). Australias Graduate Destination Survey from 2009-2011 reveals their employment outcomes to be near identical to those achieved by domestic students (99.6% working full-time at four months compared with 99.7%). The source country was almost irrelevant, with 100% of Canadian, US, Malaysian, Indonesian, Taiwanese, Norwegian and Botswanan students fully employed, compared with 97% from Singapore and 89% from China. As part of Prime Minister Julia Gillards $620 million telehealth initiative, the Australian government is funding video hook-ups between medical specialists and patients. The nations Medicare program is offering 50-percent bonuses to specialists who adopt telehealth technology and 35-percent bonuses to doctors, nurses and midwives who participate in video consults with patients. The initiative which Gillard had promised to enact during her election campaign last year has the backing of the Rural Doctors Association of Australia (RDAA), which said it has real potential to improve access to specialists for rural and remote Australians. Currently many rural patients are forced to travel hundreds and even thousands of kilometers for specialist consultations, given the significant shortage of specialists in rural and regional Australia RDAA Vice President Peter Rischbieth told reporters. These patients face significant travel and accommodation costs, and long periods of time away from work, in getting to and from these consultations, which can be required at regular intervals for many conditions. But while offering incentives to providers to implement the technology and rebates to physicians, nurses and midwives for their time spent in consultations, the real question remains: Will providers see enough of a benefit to continue offering telehealth services after the government support dries up? As part of her National Digital Economy Strategy, Gillard is pushing for roughly 500,000 telehealth consultations per year within four years a process expected to be made easier as the nation moves to adopt a National Broadband Network. “The NBN should provide us high availability, high speed connections, which will allow us to conduct both video consultations, look at images such as radiology images and also, with high definition cameras, be able to see high definition images the same as watching a high definition television,” said Nathan Pinskier, a general practitioner in Melbourne who serves as the e-health spokesman for the Royal Australian College of General Practitioners. ‘Tyranny of distance’ While Pinskier was speaking to an Australian television station on Thursday, Gillard, in Darwin in the northern part of the country, and Health Minister Nicola Roxon, far to the south in Adelaide, were demonstrating a telemedicine consult to reporters and film crews. The interviews were part of a flurry of television, print and web news stories released to promote todays launch of the initiative. “I think the change is probably going to be an incremental one but, over time as we understand the utility of telehealth and how it fits into practice, it will make some substantial differences, particularly for patients and consumers in rural and remote locations, where they suffer the tyranny of distance,” Pinskier said. According to the RACGP, 96 percent of the nations doctors use computers for some clinical purpose. To that end, the organization urged its members not to rush out and buy telehealth equipment until it can complete an implementation guide. The group is also working on a set of telehealth standards for its members, which it expects to complete in October. We encourage all GPs to wait for guidance from the College before purchasing equipment or engaging in contractual arrangements with providers, said Mike Civil, chairman of the RACGPs Telehealth Standards Taskforce, in a statement issued last week. The RACGP is currently reviewing the different technologies and connection options to provide a choice from a range of vendor equipment as a means of ensuring interoperability between them. While the Australian Medical Association offered support for the initiative, Vice President Geoffrey Dobb said the organization is concerned that, once the four-year project runs its course and the federal funding concludes, providers will find it too expensive to keep it up or theyll pass the extra costs on to their patients.